I bought a bone stock C6 last year from a elderly gentleman. After a month or two I found myself wanting more power! I've tried reading and scouting the internet for information and what I've found was; Headers, axleback, intake, cam. My goal is to get to 500~ hp (stock Z06 power) so about 420-430Whp? What size headers should I get, does it matter (N/A application) if it's 1-7/8 or 1-3/4 or even 2"? With say an Borla axle-back ATAK system, would it be obnoxiously loud? I've been youtube;ing lots of diffrent cams to find that sweet choppiness and I really liked TSP(?) Bald Eagle cam. Is it a good streetable cam? Does it matter in which order I get the parts and install them or should I wait until I can get it all at once? Can you guys recommend some good rotors and pads that can withstand some trackdays? Get it all done at once if you can, as you will most likely want to get a tune to enhance the performance of your aftermarket parts. I bought all the parts for my 03 Z at once, cam, etc. Went with the Texas Speed Tsunami cam and all supporting parts. Sell the car and find a Z06 and have the heads repaired. The attempt to make your car something its not will cost way more that just finding something that was engineered correctly in the first place. Supporting mods will cost a bundle to do it right what type of budget ? No need for a big cam to get the # you want. There are cars here that make over 450 to the ground with small cams and others with way bigger cams that struggle to hit that #. Last edited by cuisinartvette; 04-12-2019 at 05:26 PM. Disregard post number 3. That is a rediculous response. OP, I was once where you were when I bought my new C6, I wanted to up the HP ante and I added 13/4" headers/tune thinking that was as far as I was going to go. A few years later it wasn't enough and needed more so I went the SC route. At that point I wasn't about to swap the headers to the 1 7/8" so I just worked around it and in doing so left a little HP on the table. Morale of the story, think down the road if you think you might go bigger power wise. If you don't do a bunch more the 1 3/4" will make more TQ. To make a ls3 c6 as fast as a c6z will likely end up costing more than just getting a stock z06 with the heads fixed. It takes quite a bit more hp with an ls3 to keep up with a z due to the z being lighter and having better gearing. If it were my car I would do 1 7/8” headers with a cam kit, likely from btr and the car should make around 470-480whp. Cam and Headers and an intake should get you there in an LS3 car. I did it with an 05 LS2 car with a small cam and ported stock heads, headers and FAST 102 intake manifold. My LS3 made 468rwhp with Vararam intake, 1 3/4 long tubes, Borla Stinger exhaust and BTR stage 2 cam. You'll need a tune. Do it all at once if you can. Last edited by doomi; 04-12-2019 at 10:00 PM. Most headers aren't made in 1-3/4 anymore as there is hardly any difference versus 1-7/8. 2" is too big unless you have a Z06 with the LS7. Sound and loudness is a matter of taste, but I think headers with almost any aftermarket axle-back may be too loud. Headers alone will be a large increase in sound, even more so if you go catless. I would add headers, see how you like the sound, then add an axleback if you want. Adding an axleback won't require a re-tune as they don't really make much difference in power. 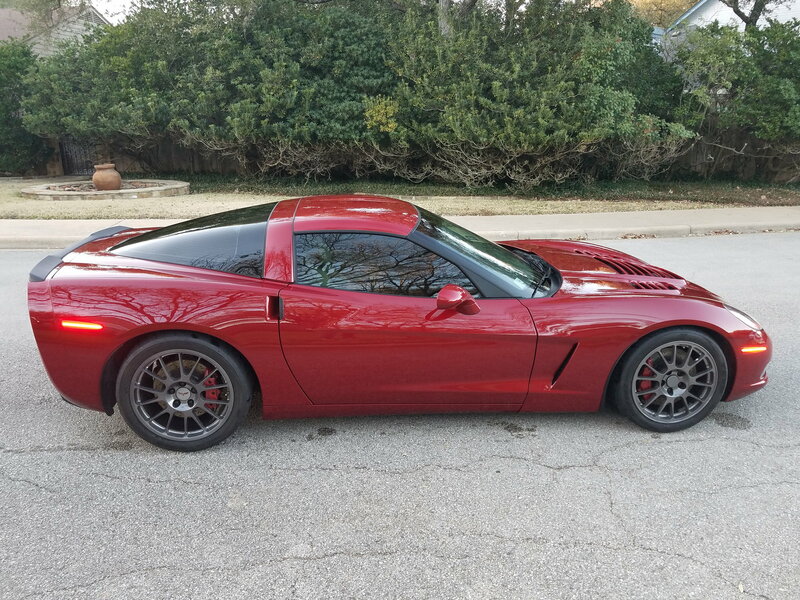 Not sure what year your car is but 2008 and forward (I think), all C6's have a Z06/Grand Sport style of intake which is as good or better than any aftermarket intake. Save the $500 and just add a shroud to isolate the hot engine bay from the intake. Before 2008, there are gains to be had from an aftermarket intake. Or you can purchase a used Z06 intake and save some money. A proper cam is also a nice upgrade and there are tons of them out there. Ideally, since you have defined what power level you want to be at and you want it to be streetable, this helps to zero in on a proper cam. Definitely, give Cam Motion or Texas Speed, or BTR a call and have a talk with them as they will be able to recommend a proper cam for you. PatG will also be able to spec a perfectly customized cam and even a tune for you setup. You didn't specify if you car is an automatic or manual. Depending on the cam recommendation, you may also need a torque converter for an automatic. And I would do everything a once (except an axle back) and then have it tuned. Another viable route to more power is a supercharger system. ECS, A&A for a centrifugal supercharger system or Edelbrock E-force and Magnuson Heartbeat for blower type supercharger. The centri's have higher power potential and make power more in the mid and upper rpm's. The blower systems have more torque lower in the RPM's and tend to be more streetable. Both are great. This past week I finished installing an Edelbrock E-force in my 2011 Grand Sport and it is awesome. I got the 554 hp kit and with the 6-speed, dry sump cars like mine with about an 11-12% drive train loss, my car should be about 485 to 500 hp to the wheels. And I have on order a 3.5 inch pulley and a Ken Bell Boost-A-Pump so that I can get to the 599 hp E-force power levels (about 525 to the wheels). This kit from Edelbrock comes with a stock 91 octane tune so there is definitely more power to be had with a 93 octane custom dyno tune. I purchased the 554 HP kit from RDP store and with their 10% off code and free shipping, it was just shy of $6500 shipped to my door. And I can build on top of that if I want to with headers, cam, heads, etc. in the future if I want even more power. Last edited by Spaceme1117; 04-13-2019 at 08:31 AM. The power was more of a guideline rather than needing it to be faster then a Z06. My mates jokingly said that the ***** marker for a summer car is 500hp. My C6 is a 06 LS2 manual gearbox. I think I'll go headers,intake,cam,tune first and (if needed) add axle-back later. I'll check with Texas speed or BTR regarding a cam kit. What are the support mods (if needed) and are they super expensive? The more I read about cams and LS engines the more I realize how little I know about cars. Just took it out from hibernation today and it was great driving it home. Very excited about how it will feel post-mods. Definitely 1 7/8 LTs ARH fit great and are one of the top 3 preferred brands. Fast 92 will be worth ~20 RWHP over stock with a medium sized cam. Cam Motion has excellent customer service in my and manies experience. for drive ability with a manual trans and a good tune with a LS2 IMO. sold a bigger cam than you need/want. The idle "chop" will come from a very good tune and a low idle speed. Almost any medium sized cam will provide that sound with a low idle. will give you the opportunity to find just the right one. droned from ~1500-1900 RPM and was loud pretty much all the time. Now with a fully built custom engine is multiplied 2X. My 07 C6 is completely stock (for now) except for the Corsa Sport that were on it when purchased. Honestly it's cheaper to buy someone's already built. I have one for sale for instance with 525 rwhp, 4.11s, a Mini tub with 345 rear tires, it's so fast it spins thru 3rd gear easily. It eats Z06s while having a removable roof, cheaper insurance, being way more reliable, and looking better quite frankly. I personally would not consider FI unless I lived and drove at high altitude for a multitude of reasons. It is absolutely astonishing how much misinformation is thrown around here and either misconceptions or just plain ignorance is spread as gospel. An LS2/3 can be made to outrun a stock Z06 (1/4 mile) with relative ease. It still is not a Z though, no question there. Intake, heads, cam, exhaust, tune...the norm, nothing fancy. Gearing is the same for manual transmissions unless it's a Z51. The weight difference is minimal but a few extra HP makes up for that. I remember how people said the same about modding an LS1 vs a stock LS6. Laughable. As for cost, that depends on a multitude of factors. High mile C6Z is under $30k. High mile LS2/3 can be found for under $20k with decent ones for low $20s. Comparing a similar mile/year LS3 to Z06 leaves a ton of room for mods. Not saying one is better than the other. It depends on what you want. No wrong answer, just different correct ones for different people. Last edited by TLS_Addict; 04-14-2019 at 06:10 PM. I'd get a used supercharged system. Even just a basic supercharger kit ALONE (no LTH, cam, etc.) will get you at or above 500hp. If you keep your eye out, you can find 'em for <$3k.